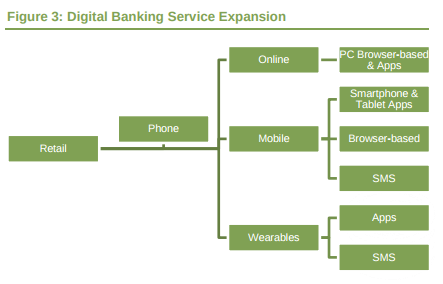 While many people now prefer digital banking and online channels, a sizable group still prefer an in-branch experience -- particularly when compared with a call to the bank's customer service center. While this continued to be the case in the past 12 months, it will change as more banks utilize multiple channels. This transition is likely to be centered on the mobile device as banks enhance their smartphone apps with more functionality and increased security. It's a trend that will coincide with the declining workforce and the number of bank branches. "Recent industry shifts highlight why traditional banks must respond rapidly to retain market share by cultivating new revenue channels and enhancing existing base through sustained innovation," said Nitin Bhas, head of research at Juniper Research. Over 2 billion mobile users will have used their devices for banking purposes by the end of 2021 -- that's compared to 1.2 billion this year globally. Growth in mobile banking is being driven by consumer adoption of banking apps and the changing way consumers manage their finances. According to the latest worldwide market study by Juniper Research, the number of mobile banking logins are now exceeding that of internet banking logins in many markets. For example, the British Bankers' Association announced that banking app logins in the UK reached a record 11 million per day during 2015, compared to 4.3 million internet banking logins during the same period. Meanwhile, a recent survey conducted by Juniper Research found that around 65 percent of mobile banking customers in the U.S. and the UK markets use an app to conduct banking services. The study also found that banks are becoming increasingly concerned that their market position is being undermined by new fintech vendors that are enabled by evolving technology and regulations to enter the marketplace. For example, in the UK alone 5 new digital banks received licences or launched services so far in 2016, with a reported 20 additional banks currently in talks with regulators to receive a new licence. Furthermore, by 2017, banks in the EU will be compelled to open their software APIs. This will result in many innovative new products that analyze user data to create more attractive financial services for customers.